Meadowsweet starts to bloom just as the elderflowers are finishing. They like to grow along the canal, rivers and generally damp watery places. They look like a cream fizz bomb on a stalk and have a super distinctive smell, a bit like marzipan. Similarly to elderflowers bugs love them so when you’re harvesting the flowers de-bug first! They contain salicyclic acid which is the chemical component that asprin was originally derived from. 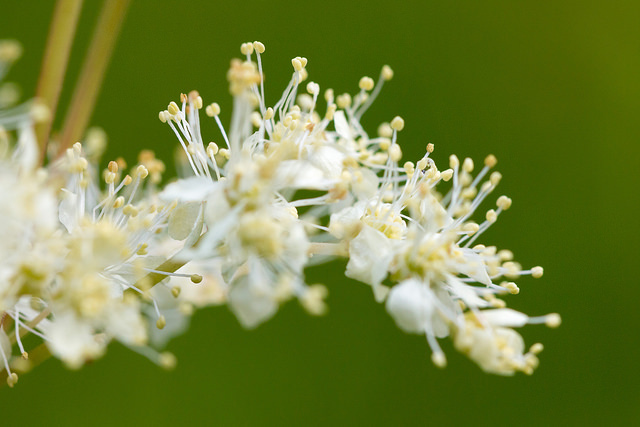 Therefore, similarly to asprin, meadowsweet is best avoided by those who are pregnant, asthmatic or taking warafin. Pour the water into a large saucepan and add meadowsweet flowers. Bring to the boil and then add the sugar and stir, until the sugar has dissolved. Turn off the heat, add the juice of one lemon and let the flavours infuse. Drain through a fine sieve, season with more lemon juice if desired. Serve with plain or carbonated water and garnish with lemon and strawberries.